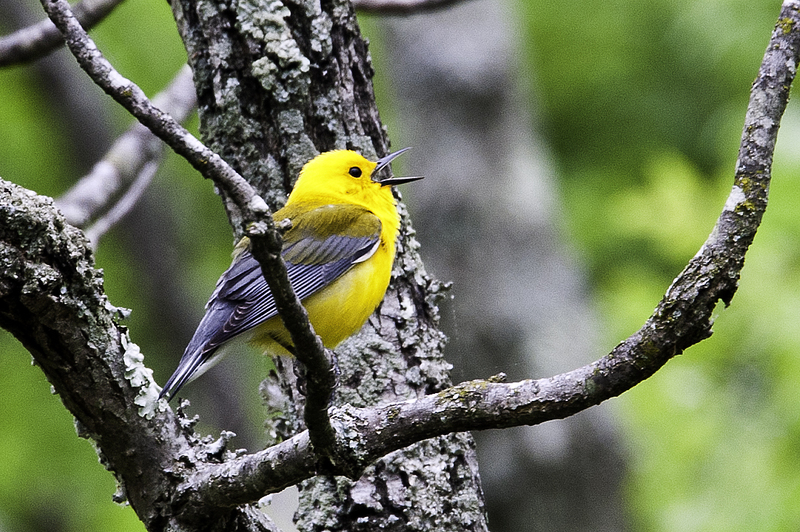 Just a quick update this evening because I am excited about the shot I got of a prothonotary warbler. Tomorrow, I will post a few photos from this weekend and upload them and more to my website. It was a gorgeous spring weekend here in northern Virginia. Today, Angela and I hiked our favorite local park–Leesylvania State Park. While walking through Bushey Point at the park, I heard a bird just singing its heart out and very loudly. Then, I saw it and could not believe its vibrant yellow color, and it was within range for a decent shot with my 28-300mm. The warbler’s location on a branch of an old tree provided the perfect contrast. This entry was posted in Bird Photographs and tagged Leesylvania State Park, prothonotary warbler. Bookmark the permalink. and you caught him “warbling!” how adorable!